We have been torn in so many different directions recently and have not posted anything. We will be at the event again this year with Alice and her friends. She wanted to assist in the announcement so I am letting her add her 2 cents. During the Outdoor Adventure event on October 14th, one of the staff came by and snapped a picture of Alice to post on their instagram account. Alice and her friends will be at Outdoor Adventure at The Rock Ranch this coming Saturday, Oct. 14. 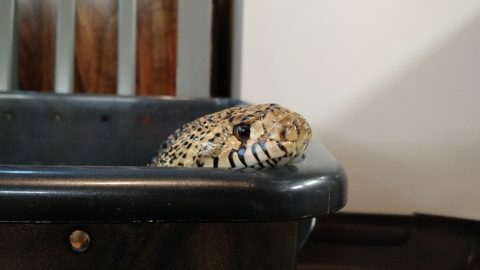 We have snake shows at 1pm and 3pm. The event is open from 10am to 8pm. Weather should be great. Check it out! Elachee Nature Center had a record number of exhibitors this year and around 1,200 visitors came out to learn about snakes and our other native reptiles. Alice was a big hit again and garnered a couple of pictures in our local newspaper. 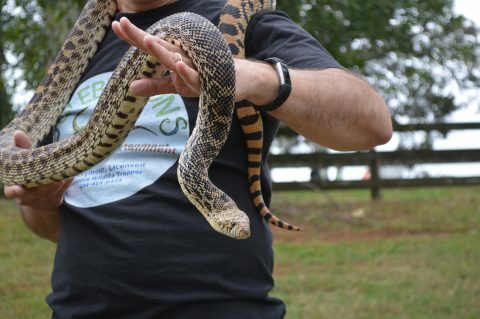 We also had our American Alligators, Nip and Tuck, Eastern Ratsnakes, Pete and Repete and Autumn, our Eastern Copperhead. I did not have time to look around, however I did spot some really cool animals as the other exhibitors were setting their displays up. Alice and the rest of us will be back again next year. Alice is happy to know she gets a few weeks break before her next big outing. Seriously Dad! How long does it take to wash the water bowl and spot clean? Alice’s yearly wellness checkup went well on Thursday. As hoped for, she had dropped a little bit of weight and is down from about 7.3 lbs to a hair under 7 lbs. 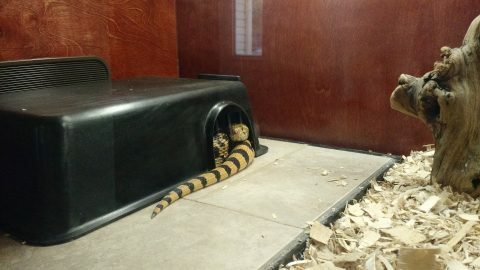 After being fondled from one end to the other by her Dr. she decided to curl up in one of her hides at home and keep watch. Also, I forgot to provide an update on the music video she was in. As a warning to children and adults at work , the video contains adult language. The video is “I’m So Real” by Young Dolph. Also in the video is our Common Boa Constrictor, Bones and the Eastern Ratsnakes, Pete and Repete. Alice and friends will be back at Elachee Nature Center later this year as well as the Rock Ranch for Great Outdoor Adventure. She continues to amaze people at events by how calm and easy to handle she is. She turns nine this summer. If we are lucky, she will grace us with her presence for at least another nine. Still waiting on the release of the music video Alice and a few of our other snakes had parts in. Alice is doing well and is presently digesting the rat I fed her yesterday. We have a couple of upcoming programs that she will be a part of as well; One birthday party and one presentation for a local preschool.